Euronégoce Distributions offers you here its toilet gel with multiple properties allowing an efficient and complete maintenance of your toilets: this product is descaler, disinfectant, bactericidal and deodorant. This product is economical because it is self-sufficient, and has the advantage of leaving no trace on the wall of your bowl. This product is available in 1 liter bottle. The bactericidal descaling and bactericidal disinfectant gel is a care product specially adapted for use on your toilets and urinals. Its ultra powerful formula presents a multitude of properties for a total and efficient maintenance of your sanitary, since this product will descale, disinfect and even deodorize your bowl surfaces, all without leaving any trace. It is intended for single use, and is safe for your septic tank. You will find your Euronégoce gel in bottle of 1 liter. 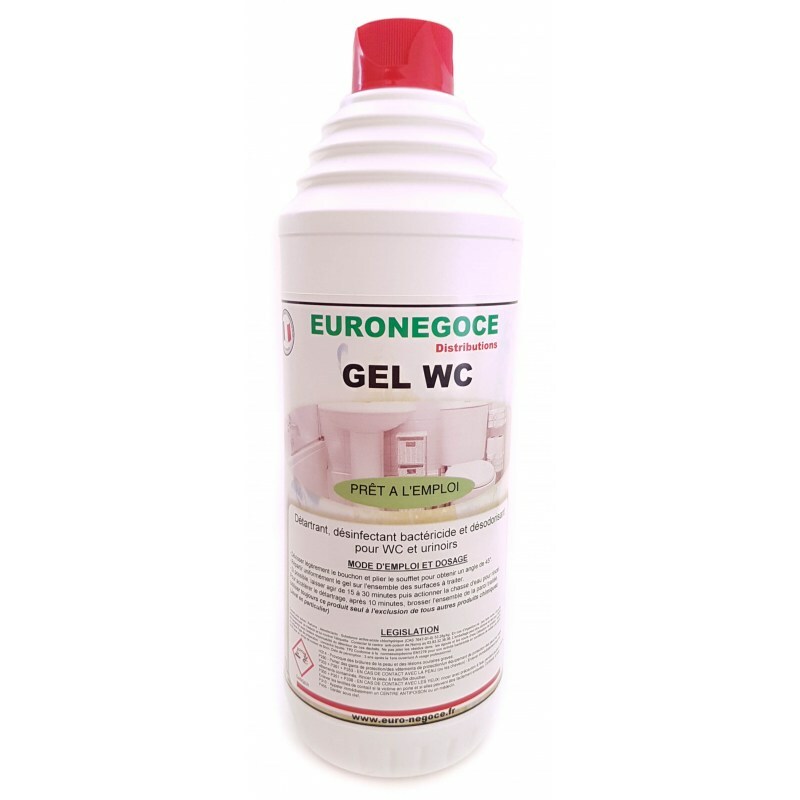 This Euronégoce cleaning gel is packaged in a large capacity 1 liter bottle, allowing you to carry out many washes. It has an acidic pH giving it very good chemical properties capable of easily eradicating all the deposits and scale stains installed on the bowl of your toilet or urinal. Its formula made by professionals is both respectful of your septic tank and the environment. This product consists of perfumes, disinfectants and hydrochloric acid. According to the established legislation it is more than 90% biodegradable, however do not throw it in sewers or waterways. It can cause skin burns and serious eye damage, so we recommend that you prepare safety equipment before use, such as gloves and eye protection equipment. First, slightly unscrew the cap and bend the bellows to obtain a 45 ° angle. Apply the gel on your surfaces to be treated by distributing it evenly. If possible, let the product work for 15 to 30 minutes before flushing to rinse everything (to accelerate the descaling you can, after the first 10 minutes, brush the treated wall). Use this product alone, without adding any other chemicals, especially bleach. Store the descaling gel out of reach of children, the expiry date is 3 years after opening. Euronégoce chemicals are manufactured in accordance with the highest standards of safety and hygiene in accordance with the decree concerning cleaning products for equipment in contact with foodstuffs. Its formula is also deposited in a competent poison control center. You are therefore guaranteed to obtain a product combining both high security of use and exemplary quality. We use transport partners for the delivery of our products, and ensure 100% our products. We strive to provide you with the fastest delivery and guaranteed products in excellent condition. If you have any doubt, refuse delivery and notify specific reservations on the waybill in the presence of the driver, otherwise we can not be held responsible if the goods shows significant damage.